A great technique for clearing oneself is to determine what energy is yours--and what energies belong to others. Of course, once you “house” energy that didn’t originate with you, it begins to feel more or less like your own. I feel that for us to be fully authentic and “who we are”, we need to differentiate between what is our own energy and what is another's energy. Why is this? Aren’t we really all One with each other? Until we are at a stage where we embody full self-realization, unconditional love, and soul understanding, we can take on other’s difficult energy traits, fears, lack of wisdom, self-esteem issues, and much more. Seldom, is it a matter of taking on their higher level traits. And that would be another situation entirely. There is nothing wrong about feeling and incorporating pure unconditional love that emanates from an ascended master, for example. Their sharing of those vibrations serve to elevate our own personal vibrations. Darshan1, from a living saint, is considered to be a wonderful and elevating experience. ~ Place a grounding cord into the earth from your tailbone. ~ Starting at the base chakra, you will be going through each chakra, one at a time. ~ I recommend going into the chakra as though you were entering a cave. You can seamlessly enter into it at any point. “Look” around for floating baggage; energies that are not yours, or energies that are, but are no longer needed or wanted by you. ~ You can patch up the leaks inside of the chakra, as though you were plugging up a dike. ~ From the outside you can incorporate the energies back to you. But not before cleaning them up! To do this, pick a color flame and pull the energy through the flame before incorporating it back into you. Why bring it back at all? Because it is your energy, and you are reclaiming it. 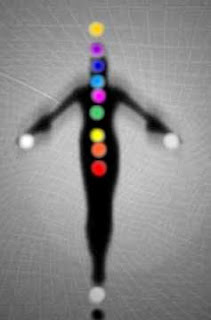 ~ When finished with all the chakras, clear and check your grounding cord. 1 The experience of a master transferring high level divine love to the initiate or disciple though touch or gaze, or just sending the energy. © 2005 Emerald Star Publishing and Alijandra. All rights reserved.